WEST HARTFORD - The Plainville and Newington boys swim teams made sure to conclude their seasons on a strong note as the Class S and Class L state finals were held Wednesday night. The Blue Devils scored a total of 94 points to finish 18th in Class S at Cornerstone Aquatic Center after many strong swims. The 200 medley relay team of Brandon Paznokas, Graham Eyres, Joseph Michalic and Taegan Brochu claimed 17th place with a time of 1:55.26. Michalic then competed in his first individual event, the 200 IM. He finished with a time of 2:14.81, good for 16th place. Brochu finished 23rd overall in the 50 freestyle with a time of 24.68. 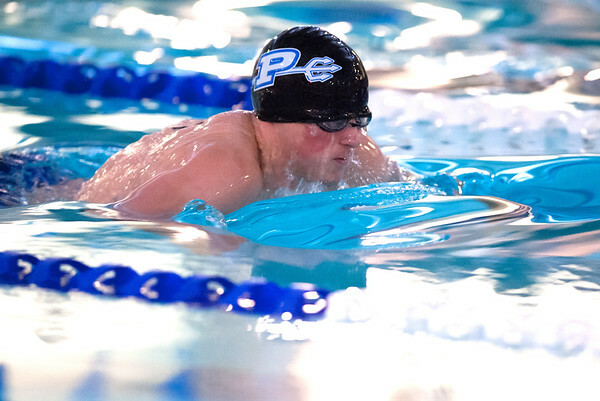 Brian Buckley was the sole diver representing Plainville, as he finished in seventh place, with a score of 266.95. In the 100 butterfly, Michalic placed 18th with a time of 59.13, while Brochu finished 24th overall with a time of 1:02.96. The Blue Devils’ 200 free relay team of Michalic, Eyres, Marcos Gutierrez and Brochu finished in a time of 1:40.87, dropping 1.30 seconds, giving them a 13th place finish. The 400 free relay team of Kyle Sullivan, Christopher St. Lawrence, Andrew Kane and Gutierrez had a 17th place finish with a time of 3:54.02. The Indians scored a total of 94 points for a 17th place finish in Class L at Wesleyan University. Newington’s 200 medley relay team of Sean Abrams, Joseph Olandt, Maksym Ugrak and Robert Nagy finished 15th with a time of 1:48.32, dropping 2.45 seconds. Nagy then competed in the 50 freestyle, where he finished 18th with a time of 22.46. Nagy also placed 17th in the 100 freestyle with a time of 49.18. John Famiglietti and Abrams both represented Newington in the diving portion of the meet. Famiglietti placed 20th overall with a score of 261.45, while Abrams placed 22nd with a score of 240.85. The Indians’ 200 free relay team of Nicholas Goegel, Phillip Bucchi, Patrick Juvencio and Salvatore Scata finished in a time of 1:40.39, dropping 2.32 seconds and claiming an 18th place finish. Newington’s 400 freestyle relay team of Scata, Juvencio, Ugrak and Nagy dropped a total of 3.12 seconds, for a time of 3:36.61 and an 11th place finish. Posted in New Britain Herald, Newington, Plainville on Thursday, 15 March 2018 21:03. Updated: Thursday, 15 March 2018 21:06.